IF YOU’RE READING this, we’re going to assume you’re already a fitness fan. But have you ever wondered what the transition from professional to amateur sportsperson is like? Or how a young athlete combines playing at the highest level of two sports as well studying for her Leaving Certificate? Or what it’s like to train for your first full triathlon? If the answer to any — or all — of the above is yes, we’d like to introduce you to our Follow Fitness programme. In association with Avonmore Protein Milk, Follow Fitness is a new kind of fitness content on The42 combining diary-style columns from three leaders complete with fitness and nutrition advice. 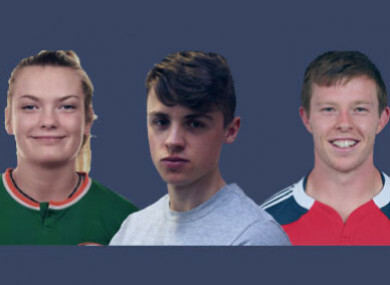 Over the next 12 weeks, you can follow Jonny Holland, Saoirse Noonan and Ryan Bailey as they outline three very different fitness journeys. Former Munster out-half Holland retired early because of injury but has since qualified as a nutritionist and will outline the changes he had to make to his life since he last kicked a rugby ball as well as using his new expertise to help you achieve your fitness goals. Noonan, an Ireland international and Cork ladies footballer, will guide you through the challenges of being a multi-sport athlete as well as giving training advice. While The42‘s own Bailey — fresh from his first marathon — is taking on the challenge of training for a debut over the full triathlon distance. Over the coming weeks, you can read all their stories here and follow their exploits on our Instagram page. You can also hear from them on a special Facebook Live we will be broadcasting later today. Email “Follow Fitness: Check out The42's new series tracking three very different fitness journeys”. Feedback on “Follow Fitness: Check out The42's new series tracking three very different fitness journeys”.